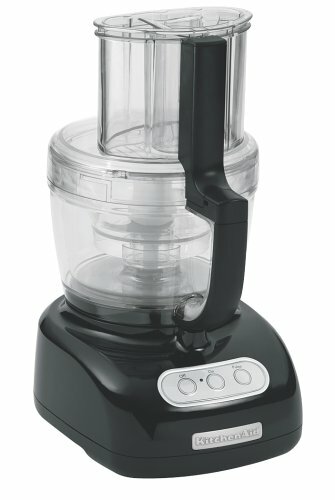 Which Food Processor Should I Buy? KitchenAid or Cuisinart? Before reading my review of these two top quality food processors that any home chef would be thrilled to own, be sure to read my web page called Choosing the best food processor. A food processor is one of two small kitchen appliances (stand mixers are the other) that cost a fair amount of money. Although there are many brands from which to choose, in order to get a sturdy, reliable machine without spending $1000, the two most viable brands are Kitchen Aid and Cuisinart. You really cannot go wrong with either of these brands, but the small differences between the two can ultimately help you choose the best one for your needs. Let’s look at two comparable models: The Kitchen Aid KFPW760 at $229.95 in one corner and the Cuisinart DLC-2011 at $179.95 in the other corner. We’ll compare them according to power, design, basic features and extras. Then, you can make an informed decision on which food processor will work best for you. Keep in mind, neither of these two models have any real negatives, so either way, you will get a fantastic machine. The Kitchen Aid model boasts 745 watts and 1 speed while the Cuisinart offers 635 watts and three speeds. I wouldn’t necessarily make my decision based on wattage alone, however. Remember, the real test isn’t wattage, but horsepower and torque. I couldn’t find this information for either of the brands. One speed is really all that is necessary (commercial models have one speed). Cuisinart offers a lower speed for mixing stiff doughs and a pre-set dough speed along with the standard processing speed. The Kitchen Aid has a 12-cup capacity, and the Cuisinart has an 11-cup capacity. For all intents and purposes, they are identical in this aspect. As well, both offer touch pad controls. This is a nice feature that makes the machine easier to wipe clean, because you don’t need to worry about any food getting caught in the tiny cracks between the buttons and the housing. One interesting difference between these two processors is the configuration of the feed tubes. The Cuisinart offers the widest feed tube available. This allows you to process whole tomatoes or potatoes without cutting them up into chunks first. The Kitchen Aid offers a fairly wide feed tube with an additional feed tube that you can insert into the main one. This second tube is narrow, and is a nice feature for holding long, skinny foods, such as carrots or celery, upright for slicing. While the tube-in-tube design is slightly gimmicky, it is also effective. The choice is yours. Another design difference is the bowl shape. The Kitchen Aid’s work bowl is has slightly tapered sides. The Cuisinart work bowl has straight sides. Again, let your preference be your guide. One thing I will point out is that the tapered bowl does not have as much room for a blade as the straight-sided bowl. On the other hand, the tapered sides perhaps give Kitchen Aid the edge in processing capacity, as food would tend to slide down the sides towards the blade. The Kitchen Aid model comes packaged with a stainless steel multi-purpose blade, a plastic dough blade and slicing and shredding discs. The Cuisinart has the stainless steel blade as well as a slicing and shredding disc. The Cuisinart people say that using the metal blade for dough is better than using a plastic blade, as the metal blade will cut, rather than drag, through the dough. For what it’s worth, I have never used the plastic blade, although this is based more on personal preference than on functionality. The Kitchen Aid comes with a 4-cup mini work bowl and blade. This is a nice feature for processing small amounts of food. Both brands offer shatter-proof bowls that are heat and cold resistant. Kitchen Aid has the edge on cleaning, as all of the KA parts are dishwasher-safe. Cuisinart recommends hand washing, which can be a bit precarious when dealing with a very sharp blade and hot, soapy water. The “extras” is where personal preference really comes into play. The Kitchen Aid comes with a lidded storage case for the mini-bowl and all the blades and discs. The container is very nice, and it keeps all your attachments safely (and dust-free) in one place. The container does take up a bit of space, so you might want to factor that into your decision if you have limited cabinet and/or counter space. The Cuisinart’s big extra is a how-to DVD complete with a bread demonstration and recipes from professional chefs. The video can be very helpful in learning how to use the machine, especially if you’re a visual learner. The Kitchen Aid comes with a one-year warranty on parts. The Cuisinart offers a ten-year limited warranty on the motor. That’s a long time, but you will most likely have a part fail before you have the motor fail, so take that into consideration, especially if you will be using the food processor on a frequent basis. And last, we come to price. The Kitchen Aid model is $40 more than the Cuisinart model. However, for that $40, you get two extra blades, a mini bowl and blade, and a lidded storage container. You will have to decide for yourself if the extras are worth it. Remember, you cannot go wrong with either of these models. Both are designed for the home kitchen and are based on commercial designs. While many home cooks might be swayed by a lot of bells and whistles, when it comes to utility, simple is definitely better. Both of these machines are simple to operate and maintain and are attractive enough to leave out on the counter. No matter which one you choose, know that you have gotten your money’s worth and should get years of use from your new food processor. Food Processor models change so quickly that I could recommend one today and tomorrow it might be obsolete. So I suggest you go by brand names. There are several very good manufacturers of food processors and I suggest you take a look at Cuisinart, KitchenAid and Viking. Check out my sources below and find a model that fits your needs. Remember, you don’t have to have the biggest, baddest processor if you don’t do a lot of cooking, but they sure look good and are fun to own. I just bought a Cuisinart from Amazon and it’s a great machine. Much better than the Kitchen aid.